Ninja Girl Toddler app is designed to help your child acquire basic concepts of shapes, colors, numbers and more. Ninja Girl Toddler School: Adventure Mini Games for Kids offers an all-in-one game for your children. It is a collection of different exciting, fun and cool kids educational games. 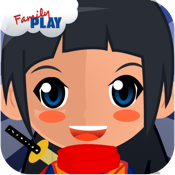 It is not just any ninja games for your kids but 12 mini games for your family where you’ll have fun while learning. The app gives you animated Ninja Girl character, ninja stickers, energetic voice recording and sounds, all designed for your boys and girls. It’s an unlimited game for the entire family! 2. Your child presses one button to immediately launch into nonstop play. 4. The child is guided through game play. 5. Uses animation for correct answers and gentle redirection for incorrect ones. This game teaches shapes, big VS. small, numbers 1-10, letters of the Alphabet, and be able to recognize which object does not belong to the group. This toddler game consists of 12 different level boards or mini educational games for kids to learn, ordered from easy level to harder and challenging levels. This ninja adventure game is designed to provide not just fun and interactive game for kids but a quality fun and interactive playtime for parents and their kids. Please join our community and tell us what you think or your comments and feedback. We truly appreciate anything you can give us. Like our Facebook Page, http://www.facebook.com/FamilyPlayApps, and get the latest updates, contests and some freebies. You can also follow us on Twitter, @FamilyPlayApps, to get the latest news and new apps from Family Play. If the sound is not working, make sure the mute is turned off, then turn up the volume and the sound will work. If you do like our app, please take a minute to rate and write a great review.